The Vava’u archipelago in the Kingdom of Tonga was identified as a priority area by the Tongan Government for implementation of a Global Environment Facility (GEF) funded biodiversity conservation project executed by the Secretariat of the Pacific Regional Environment Programme. The Integrated Islands Biodiversity Project (IIBP) includes the Cook Islands, Nauru, Tonga and Tuvalu and is assisting these Pacific island countries to implement their commitments under the Convention on Biological Diversity (CBD) Island Biodiversity Program of Work. This paper focuses on the project work undertaken in Vava’u to establish the ecological and socio-economic knowledge base essential for determining the best options for long term conservation, management and development of this important area. The paper reviews the methods and findings of a rapid biodiversity assessment and a subsequent socio-economic assessment undertaken in 2014, and provides suggestions for ways to increase our understanding of socioecological production landscapes and seascapes. The surveys have greatly enhanced the knowledge base for sustainably managing the land and seascape of the Vava’u archipelago, confirming the value and linkages between natural ecosystems and the livelihoods and economic development of local people and the country as a whole. The Kingdom of Tonga is identified by Burley et al. (2012) as the location for the founding colony of Polynesia by Austronesian speaking seafarers who voyaged from Bismarck Archipelago in western Melanesia almost 3,000 BP. From this location the geographically diverse volcanic, raised limestone and atoll islands of Polynesia (Figure 2) were settled through further voyaging across the Pacific Ocean over several hundred years (Diamond 2005). As a consequence of early human settlement the terrestrial ecosystems of most Pacific islands underwent significant modification through land clearing for agriculture, burning and introduction of invasive and alien species. Hundreds of species became extinct within relatively short time frames (Steadman et al. 2002; 2003). Today Pacific island countries are part of the global economy and have established largely democratic societies that aspire to the benefits of modern development while striving to maintain their culture and traditional connections to the land and the sea. The Vava’u Archipelago, like most Pacific Islands, is a prime example of socio-ecological production land and seascapes (SEPLS) where communities live closely connected to the natural environment. Dependence on the goods and services provided by marine, coastal, and terrestrial ecosystems remains high. Freshwater, timber, fish and agriculture are important for subsistence purposes and a major component of national economies, especially tuna fishing, cash crops, and commercial logging. A crisis of species extinction commenced with the first human settlement of Pacific islands and continues today. The State of Conservation in Oceania assessment (SPREP 2014) reports that 1,327 species are vulnerable, endangered or critically endangered and 45% of the surviving endemic species are under threat of extinction. The role of the Secretariat of the Pacific Regional Environment Programme (SPREP) is to work with its member Pacific island countries at the nexus of environmental, social, and cultural values and how they adapt to development demands and climate change. This paper provides an example of an approach taken by SPREP and its partners to bring knowledge and clarity to the critical issues of environmental sustainability at a landscape scale. Specifically, it describes two recent surveys, one biological and the other socio-economic, undertaken in the Vava’u archipelago in the Kingdom of Tonga as part of the Global Environment Facility (GEF) Integrated Islands Biodiversity Project (llBP). Although they were implemented independently at different times, both were planned and coordinated by SPREP to provide a basis for medium to long term decision making by the people of Vava’u and the Government of Tonga to improve the environmental management of land and seascapes for the benefit of local and national economies and for biodiversity. It is intended that the approach will be replicated in other Pacific island countries. The Vava’u Archipelago is part of the Kingdom of Tonga located in the tropical southwest Pacific (18.6oS 174.0oW, Figure 3). It comprises the main island of ’Uta Vava’u (95.95 km2), bounded on its southern side by a cluster of 57 smaller islands (c. 0.02−9.0 km2) and the outlying islands of Late (17.5 km2) to the west, and Fonualei (4.2 km2) and Toko (0.43 km2) to the north-northwest. ’Uta Vava’u and most of the adjacent smaller islands are formed of karst limestone, have a stepped topography with prominent elevated, marine-eroded terraces, and are mantled with thick volcanic soils. Much of the original native forest cover of ’Uta Vava’u and the adjacent smaller islands has been removed during the three millennia of human occupation of this group, but remnants of mature forest are still present in some areas that are too steep or rocky for cultivation, including steep coastal slopes and inland scarps and knolls, and on some of the smaller cliff-bound islands (e.g. Kitu, Kulo and Luamoko). Areas of mature native forest have also persisted on some of the small, low, southern islands (e.g. Maninita and Taula), and in some more gently sloping parts of ’Uta Vava’u, most notably on coastal terraces and beach flats in the vicinity of Utula’aina Point and Vai-utu-kakau. Surrounded by deep oceanic waters, Vava’u has a wide range of marine habitats and species, most notably its coral reefs and migrating humpback whales which are attracted by the sheltered deep lagoons. In 2014, there were about 106,000 people living in Tonga, with more than two thirds of the population living on Tongatapu island where the capital, Nuku’alofa, and the only international airport are located. About 15,000 people live in Vava’u. The 2009 Household Income and Expenditure Survey estimated 20,432 households in Tonga; 3,447 in Vava’u (GoT HIES 2009). The Biological Rapid Assessment Programme (BioRAP) is a biological survey based on a concept developed, and first implemented, by Conservation International in 1990. BioRAP methods are designed to rapidly assess the biodiversity of highly diverse areas and to train local scientists in biodiversity survey techniques. It is designed to use scientific information to catalyse conservation action and since 2012, SPREP has conducted three BioRAPs, in Samoa, Nauru and Tonga. It is a useful approach when time and financial resources are limited. The Vava’u BioRAP provided a spatial and temporal snapshot of the full range of biodiversity in the archipelago (Atherton, McKenna and Wheatley 2015). 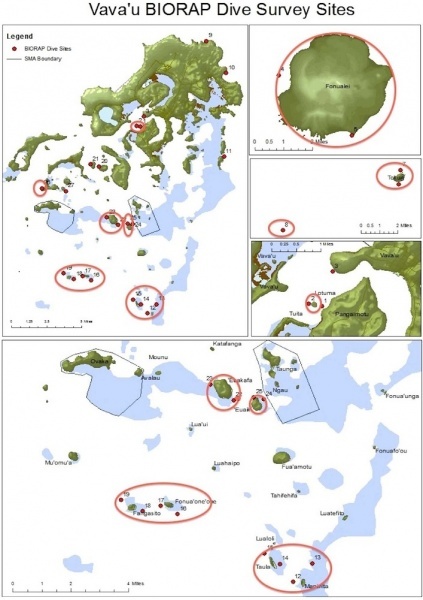 The survey did not visit all sites of conservation value in the archipelago and was conducted over a relatively short period of 16 days. However, the BioRAP is the most comprehensive biological survey conducted in Vava’u to date, and it generated a huge volume of useful information on the biodiversity of the archipelago that the Government of Tonga can use for conservation planning and management. While many biological surveys have been conducted in Vava’u in the past, there had never been a comprehensive and multi-disciplinary assessment of marine and terrestrial biodiversity in the island group, prior to the BioRAP. Criteria generally considered during BioRAP surveys to identify priority areas for conservation across taxonomic groups include: species richness, species endemism, rare and/or threatened species, and habitat condition (Morrison and Nawadra 2009). Measurements of species richness can be used to compare the number of species between areas within a given region. Measurements of species endemism indicate the number of species endemic to a given area and give an indication of both the uniqueness of the area and the species that will be threatened by alteration of the habitat (or conversely, the species that may be conserved through conservation efforts). The Vava’u BioRAP was conducted from 13 to 28 February 2014. The survey involved 17 scientists and 18 Tongan government staff. Fourteen islands were visited over the 16 days of the survey. The terrestrial survey involved assessments of land and sea birds, bats, plants, reptiles, land snails and insects while the marine survey included assessments of coral reef fish and commercial fish, corals and other marine invertebrates, sea turtles and cetaceans. The BioRAP was coordinated by SPREP, the Vava’u Environmental Protection Association (VEPA), the Waitt Foundation (which provided a ship for the marine survey work) and the then Tongan Ministry of Lands, Environment, Climate Change and Natural Resources (MLECCNR). Staff from the Ministry of Agriculture, Food, Forestry and Fisheries (MAFFF) also participated in the survey. Specialist support was provided by scientists from BirdLife International, the New Zealand Department of Conservation, and the United States Geological Survey. Terrestrial site selection was based on the following criteria: sites where past biological surveys had been done and had recorded significant biodiversity values (in particular Steadman et al. 1999); sites with currently intact native forest (using satellite imagery and recent land cover maps); and sites already managed as a national park (e.g. Mt Talau) or proposed as national parks (e.g. Maninita). Furthermore, sites were selected to obtain a good geographic spread of the islands, and with a range of different island types and geology. In all cases, approval from local landowners was obtained before sites were visited. Thirty-three different sites were surveyed by the terrestrial survey teams (Figure 4). For the marine component 27 coral reef survey sites (Figure 5) were chosen in cooperation with the Ministry of Lands, Environment, Climate Change and Natural Resources. These selected sites were predominantly fringing reefs, which are commonly associated with limestone islands such as those found in Vava’u. The detailed methodologies for each specialist discipline that carried out the BioRAP survey work is available in the full report (Atherton, McKenna and Wheatley 2015). The processes and functions of natural ecosystems are the building blocks of household livelihoods and human well-being. Ecosystems provide a wide array of benefits, such as food, shelter, and treatment of human wastes, and facilitate or support recreational, spiritual, and cultural activities. The full value of the human benefits from nature’s goods and services is not often recognized and relationships between natural ecosystems and communities, households, and businesses are often poorly understood or taken for granted (TEEB 2008). Quantitative measurements of ecosystem benefits can be used to guide natural resource management decisions such as cost-benefit analyses of climate change adaptation options, natural resource use policies, or business development initiatives. Failure to recognize the role natural ecosystems play in supporting livelihoods, economic activity, and human well-being has in many instances led to inequitable and unsustainable resource management decisions. This socio-economic assessment (Salcone 2015) was implemented by the International Union for Conservation of Nature (IUCN) in July 2014 and complements the Vava’u BioRAP. The research was commissioned by SPREP and funded by the Australian International Climate Change Initiative component implemented by SPREP. The implementation of the survey falls under the umbrella of the MACBIO project, a five-year regional project funded by the German Federal Ministry for the Environment, Nature Conservation, Building and Nuclear Safety to support and strengthen conservation and management of marine and coastal biodiversity through economics, marine spatial planning, and protected area policy. The Vava’u Environmental Protection Association (VEPA) was a key partner in the assessment. 1. Quantify the value of ecosystem services in the Vava’u Archipelago including the adjacent marine exclusive economic zone (EEZ). 2. Analyze linkages between ecosystems, households, businesses and livelihoods to support a Marine Spatial Planning Process leading to an integrated approach to marine management and decision making, establishment or re-design of protected areas, or cost-benefit analyses of adaptation options. The assessment analyzed household activities, subsistence and monetary, and quantified the magnitude of key ecosystem services in the Vava’u group. Where sufficient data allowed, the economic value of these ecosystem services was estimated. Economic value refers to quantification of the net benefits humans derive from a good or service, whether or not there is a market and monetary transaction for the goods and services. The relationship between people and natural ecosystems was analyzed using two distinctly different methods: surveys conducted especially for the study focusing on households and businesses; and identification and quantification of the value of ecosystem services using existing data. A comprehensive household survey was developed based on economic assessment work that had been conducted in Fiji by Landcare New Zealand. In total, the survey contained more than 200 questions and took nearly 2 hours to complete. Surveys were conducted by local Tongan women, who were employed by VEPA. Surveyors typically worked in teams of two to complete a total of 150 household surveys over three weeks in July 2014, in five different villages. The villages surveyed were selected to produce a representative sample of Vava’u and the number of households surveyed in each village was calculated to be representative of the total population. Households were chosen at random. Survey teams successfully returned data from 144 households. Each household was asked a series of questions about four natural resource sectors: agriculture, livestock, forests, and fishing. A small survey of tourist businesses was conducted to identify the connections between natural resources and the tourism industry. Eighteen businesses were surveyed, mostly in Neiafu, the capital of Vava’u. The sample of businesses included restaurants, resorts and guesthouses, and dive and whale-watching operators. Many businesses offer a combination of these services. One boat service and repair business was also surveyed. The survey included questions about the ownership, employees and earnings of the business, as well as the relationship between business success and natural ecosystems. Both the BioRAP and the socio-economic survey produced a wealth of results that cannot be presented in detail within this paper. Accordingly only highlights and key findings are presented. The flora of Vava’u was determined (from the BioRAP and previous surveys) to comprise about 262 native vascular plant species, divided into 188 dicots, 39 monocots, two gymnosperms, 30 ferns, and three fern allies. Eight Tongan endemic species are found in Vava’u, two of them endemic to Vava’u − Atractocarpus crosbyi and Casearia buelowii. 12 new native species were recorded for Vava’u, including one new record for Tonga: Boerhavia albiflora (Nyctaginaceae). Of concern, 42 new weed species were recorded for Vava’u, 18 of them new for Tonga. 417 terrestrial reptiles were recorded representing 11 species of lizard. 29 new species records were collected for reptiles across the Vava’u island group. 38 bird species were recorded. The blue-crowned lory (Vini australis), which had not been recorded on Vava’u for over 100 years, was found at two sites. The friendly ground dove (Gallicolumba stairii), which had been found at only one site during surveys in 1995-96, was located on three islands in this survey. Islands in the south of the group were found to hold very large numbers of seabirds. Two of three islands subject to rat control programmes in 2002 appeared to be free of these invasive rodents. No sightings were made of the endangered Polynesian sheath-tailed bat (Emballonura semicaudata). Small colonies of the insular or Pacific flying fox (Pteropus tonganus) were seen on many of the small forested islands and larger colonies on ’Uta Vava’u with up to 250 bats present. The reefs of the Vava’u group have a good diversity of hard corals, with a total of 206 species in 55 genera observed. 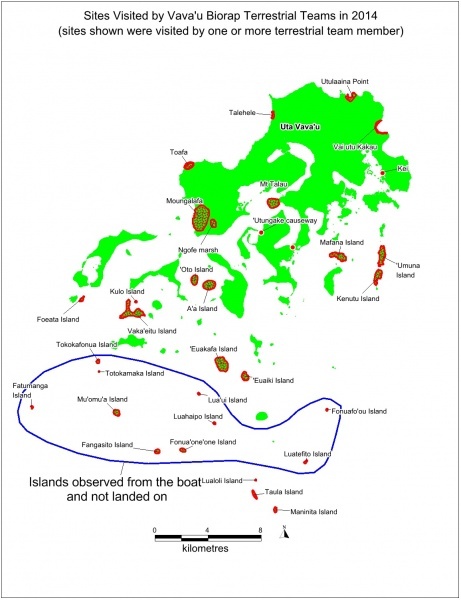 197 species were found that had not been reported before from Vava’u, 95 species were found that had not been reported before from Tonga, and 67 species were recorded that represented extensions of their known biogeographic ranges. Four species of giant clam (Tridacna maxima, T. squamosa, T. derasa and T. crocea) were recorded in the survey. The boring giant clam (Tridacna crocea) is a new species record for Tonga. Observations of rubbish and fishing debris were highest at the sites closest to the town of Neiafu. The incidence of rubbish was low at all other sites. One site showed evidence of eutrophication from septic tanks associated with a nearby tourist resort. Large marine fauna including sharks, dolphins and turtles were more frequently observed at more remote northern sites. For most other sites there were very few or no sightings of large marine fauna. Low species numbers of piscivores and carnivores, including sharks, were recorded throughout the survey. A reef condition index was calculated based on coral, fish and invertebrate biodiversity, coral cover and the density of target fish. Sites with a reef score of more than 85% and a low incidence of disease, predation and pollution were considered the most eligible reefs for Marine Protected Area (MPA) status. In total seven sites, all located in the southern part of Vava’u, scored more than 85% and are considered the most suitable areas for protection as MPAs. Ten groups of small cetaceans were encountered, representing at least three species: spinner dolphin (Stenella longirostris), short-finned pilot whale (Globicephala macrorhynchus) and bottlenose dolphin (Tursiops sp.). Evidence was found of the presence of two species that were not previously recorded in the waters of Tonga: the Cuvier’s beaked whale (Ziphius cavirostris) and the rough-toothed dolphin (Steno bredanensis). With these findings, there are now 14 cetacean species officially listed in Tonga. The humpback whale population for Tonga has recently been estimated at over 2,000 individuals. Some movement of individuals between other regions of Oceania occurs, but a high level of site fidelity has been shown within the region that is also supported by genetic analyses of population structure. Few turtles were seen during the surveys and these were mostly green turtles (Chelonia mydas). Strong indications of overexploitation of both sea cucumbers and giant clam species were noted across sites in the survey. Fish communities were highly dominated by the families of surgeon fishes (Acanthuridae) and parrot fishes (Scaridae). Families of snappers (Lutjanidae) and goat fishes (Mullidae) were poorly represented. Families of groupers (Serranidae), snappers (Lutjanidae) and emperors (Lethrinidae) were underrepresented while sweetlips (Haemulidae) appear to be on the edge of local extinction for the reef sites surveyed. The structure of fish communities was unbalanced with a high rate of herbivore species and a very low rate of predators such as large carnivore species and piscivore species. At least six species were under the minimum maturity length. Strong signs of overfishing were observed. There is an important need for management measures to ensure sustainable fish-stock use and food security over time. Residents obtain firewood and food products from the forest. Households were asked about the quantity and species of firewood and wild foods collected from the forest. Much of this forest is to varying degrees managed horticulturally, so it is difficult to distinguish between forest products and agriculture. Most use of forest products is for subsistence. About 60% of the 144 households successfully surveyed collect forest foods, predominantly coconut, breadfruit, limes, giant taro, wild yams and wild oranges. Most Vava’u households participate in some type of agriculture, with 70% of households responding that they raise crops for food or sale; less than one third of those surveyed reporting earning income from selling crops. The crops most commonly grown by Vava’u households are starches, including plantains and root crops: yams, cassava, and three types of taro. Coconuts, a leafy green called pele (Hibiscus manihot), and kava are the most commonly cultivated crops. Husbandry of animals is very common in Vava’u. Of the 144 households surveyed, 85% reported raising animals for food or for sale. More than 75% of households raise pigs, about 50% raise chickens, and 45% raise cattle. 45 households (31%) responded that they went fishing at least once per month in the past year, including reef fishing (23%), deep-water fishing (3.5%), or nearshore gleaning (20%). 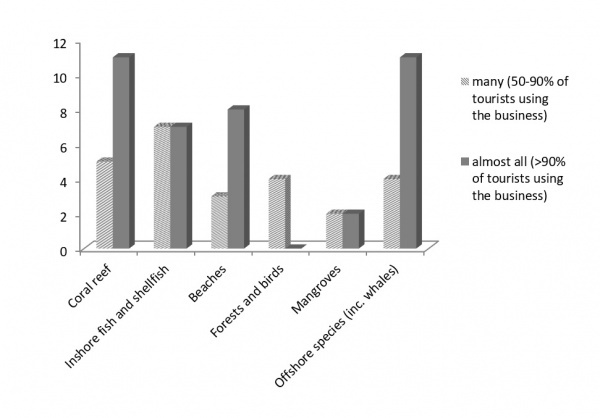 Households were asked which species were the most important for household consumption or sale. The most important reef fish were groupers, parrot fish, and surgeon fish. Arc clams (Anadara sp.) were by far the most common important invertebrate harvested in Vava’u, followed by crabs and octopus. Sea cucumbers and shellfish were also commonly part of households’ three most important invertebrate species. Most households fish primarily for their own consumption or to share with family and community members. Only 13 households (29% of fishing households) reported selling at least some of their catch. Households were asked a series of questions about the Ovaka special marine management area (SMA) in order to gauge support for community-based conservation measures and the perceived efficacy of locally-managed marine protected areas. The survey indicated that most people are not sure about the rules that apply to the SMA. However, five out of six heads of household who had fished near the SMA in the past year found that it was easier to catch fish and that they caught more fish, and four of the six reported catching bigger fish. In order to understand the relative importance of different ecosystems to businesses in Vava’u, businesses were asked the following two questions: 1) What percentage of your guests have experiences related to particular ecosystems; 2) Rate the impact that a 25% decline in given ecosystems would have on your business. Coral reefs and offshore marine areas are the most commonly experienced ecosystems for patrons of tourism businesses in Vava’u. 15 of the 18 businesses report that “almost all” (>90%) of their guests have experiences directly related to either coral reef or offshore areas (Figure 6). 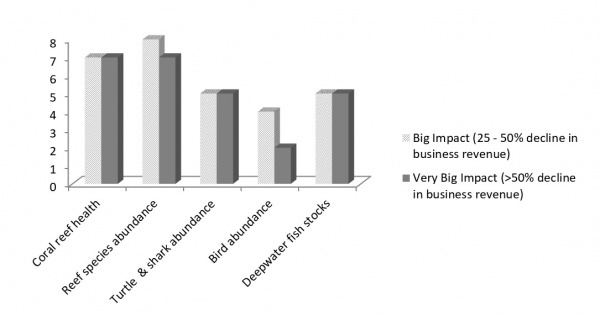 When asked about the impact that a 25% decline in ecosystem health would have upon businesses, businesses responded that they are most threatened by a decrease in reef species, followed by a decrease in coral health with 15 and 14 businesses respectively reporting an expected “Big” or “Very Big Impact” (Figure 7). 12 of 18 businesses believe climate change poses a high or very high threat to their business and the natural resources it depends upon. Businesses report a willingness to pay a local village to limit fishing, including sharks and turtles, if it could lead to a 25% increase in abundance and diversity of reef fish. Most of these businesses purchase the majority of their fish, meat, and fruits and vegetables within Vava’u. Three businesses report catching more than 75% of the fish they serve; only two businesses report importing fish or meat from overseas. 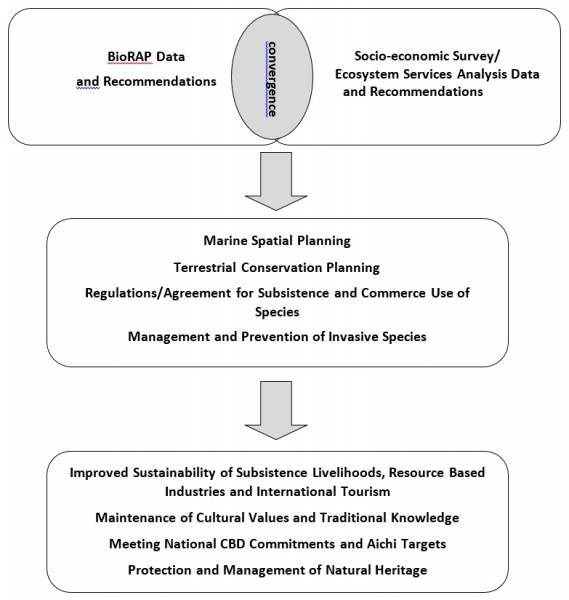 The BioRAP survey has identified key issues related to the status of biodiversity conservation and terrestrial and marine species that are important for subsistence and commerce. The identification of new species and new records for Vava’u is an encouraging sign that fauna and flora species can survive in highly modified landscapes. Conversely, the identification of 42 new weed species records for Vava’u, 18 of them new for Tonga, indicates that prevention and control of invasive species is a major issue, as it is for all Pacific islands. The apparent shift in trophic levels indicated in the marine survey by the decline in predator level species is of concern since this can create a shift in reef ecosystems to a dominance of herbivore species. The socio-economic survey has determined that local communities utilise terrestrial and marine resources, but that subsistence harvest of fish is dominated by a few species and the level of harvest is not as high as anticipated. The report notes that of the 150 households surveyed only 31% responded that they go fishing once a month, which was surprising given their proximity to the sea (Salcone 2015). Vava’u has relatively smaller reef areas compared to the rest of Tonga (70km2 compared to 3,210km2 nation-wide), so fishing pressure per area may be greater. The ‘boom and bust’ cycle of the commercial beche-de-mer (sea cucumber) industry in Tonga highlights the vulnerability of species to over-exploitation (Lokani et al. 1996) driven by large, lucrative international markets. Aside from beche-de-mer, the commercial fisheries that contribute significantly to national GDP (deep-sea demersal and tuna) are not very important to households in Vava’u. Marine ecosystems are, however, very important to the tourism industry. Whale watching and whale swimming brings significant revenue to local businesses, including food and accommodation providers. Tourist operators are reluctant to share details about their revenue and expenditures, but they exhibit a willingness to pay for species and ecosystem conservation that will benefit the experiences of tourists. Most tourist businesses are foreign owned. Although most businesses employ Tongan natives, tourism income was not a significant contributor to incomes of the households surveyed for this study. According to a 2013 study conducted for the Tongan Ministry of Tourism and Commerce, of the approximately 60,000 international air visitors that came to Tonga in 2012-2013, about 15,000 (25%) traveled to Vava’u (MCTL 2013). Vava’u also welcome six cruise ships in 2013-14, and in 2011, the last year a survey was conducted, about 1,000 yachts came to port in the Vava’u group. Figures 5 and 6 clearly show the dependence of the tourism industry on natural resources. Tourism benefits not only Vava’u but the economy of Tonga as a whole, and one of the most important income generating attractions is whale watching. Tonga is one of the few places in the world where tourists can enter the ocean with humpback whales and watch them at close range. Expenditures associated with whale watching in Tonga were 4,675,000 USD for the 2009 season (Orams 2013). Only a small amount of this economic activity reaches households. Of the 15% of residents who reported having wage-earning jobs, about 30% of them were employed in tourism related businesses (restaurants, drivers, whale-watch operators, handicrafts). Recent predictive habitat modelling around the Vava’u island group has shown that a favourable habitat for mother− calf pairs of humpback whales includes shallow, nearshore regions, whilst areas of predicted suitable habitat for adult-only groups includes deeper areas further offshore around the periphery of the island region and including seamounts and banks (Lindsay 2014). This suggests that to ensure the longevity of the whale watching industry in Vava’u, a full range of protective ecosystem management measures need to be taken across the range of nearshore and offshore ecosystems, including careful assessment of the viability of deep sea mineral mining, in conjunction with relevant whale species management action. Because agriculture and livestock are so important to Vava’u households, environmental conservation efforts need to approach biodiversity preservation within the context of agroecosystems. Two directions should be considered: 1) Species conservation within agricultural and horticultural habitats, and 2) Preservation of sparse tracks of virgin habitat where they still exist on steep slopes and rugged terrain and on distant islands. Both the biological and economic surveys have provided invaluable information that has substantially increased the level of environmental and socio-economic knowledge of the Vava’u archipelago, which can be applied to improve policy decisions and management interventions of this important land and seascape where the livelihoods of the local people are dependent on ecosystem services. A schematic representation of these linkages is shown in Figure 8. Alonso, L.E., J.L. Deichmann, S.A. McKenna, P. Naskrecki and S.J. Richards. (Editors) (2011). Still Counting…: Biodiversity Exploration for Conservation – The First 20 Years of the Rapid Assessment Program. Conservation International, Arlington, VA, USA. Atherton, J., McKenna, S. and Wheatley, A (editors) (2015). 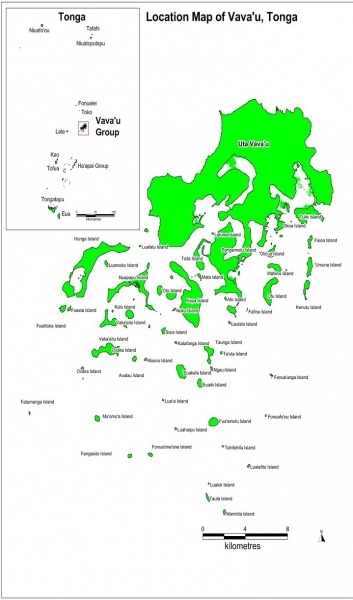 Rapid Biodiversity Assessment of the Vava’u Archipelago, Kingdom of Tonga. Secretariat of the Pacific Regional Environment Programme, Apia, Samoa. Burley D., MI Weisler and J-X. Zhao (2012). High Precision U/Th Dating of First Polynesian Settlement. PLOS One November 2012 Vol. 7 Issue 11. Diamond J. (2005). Collapse: How Societies Choose to Fail or Survive. Allen Lane/Penguin Group. Government of Tonga (GoT) (2009). Household Income and Expenditure Survey 2009. Lindsay, R. (2014). Spatial Ecology of Humpback Whales in the South Pacific. M.Sc. thesis. University of Auckland, New Zealand. Lokani, P., S.V. Matoto and E. Ledua. 1996. Survey of sea cucumber resources at Ha’apai, Tonga. Secretariat of the Pacific Community, Noumea, New Caledonia. Ministry of Commerce, Tourism, and Labour (MCTL) (2013). Tonga Tourism Statistics 2012/2013. Kingdom of Tonga and International Finance Corporation. Morrison, C. and Nawadra, S. (ed.) (2009). A rapid biodiversity assessment of the Nakauvadra Highlands, Ra Province, Fiji. RAP Bulletin of Biological Assessment 57. Conservation International, Arlington, VA, USA. Salcone, J. (2015) (in prep). Natural Resources and Livelihoods in Vava’u, Kingdom of Tonga. Secretariat of the Pacific Regional Environment Programme. Secretariat of the Pacific Regional Environment Programme (2014). State of Conservation in Oceania. Currently unreleased. Steadman DW, GK Pregill and DV Burley (2002). Rapid prehistoric extinction of iguanas and birds in Polynesia. Proceedings of the National Academy of Sciences 99 (6): 3673-7. Steadman, DW and PS Martin (2003). The late Quaternary extinction and future resurrection of birds on Pacific islands. Earth-Science Reviews 61 (2003) 133–147. Steadman, D.W., Franklin, J., Drake, D.R., Freifeld, H.B., Bolick, L.A., Smith, D.S. and Motley, T.J. 1999). Conservation status of forests and vertebrate communities in the Vava’u Island Group, Tonga. Pacific Conservation Biology 5: 191–207. TEEB (2008) The Economics of Ecosystem and Biodiversity – An Interim Report. European Communities, Cambridge, UK.